In any improvement process, managing the influence of change and the anti-change culture that will continually try to raise its head will be one of the most ardent tasks. Learn to deal with this as effectively as you do the project management itself. There are many well-written books on the subject of change in every category of change that you could imagine. Below is a compiled list of items about change that are relevant to implementing process change. When examining change it is necessary to understand the stages of change that have been identified. It is interesting to note that these stages take place in varying degrees in different people, but are exactly the same whether the change is a different process in the workplace or the death of someone close. You should be able to identify and deal with the levels of acceptance encountered. Here are the stages and some tips on how to deal with them. A wonderful self-preservation response. It is characterised by minimising the situation, and saying (or thinking) things like “This isn’t happening”, “It won’t help”, and “There’s no problem.” You may find the person will avoid talking about the situation, or even make up excuses for not attending meetings. Explain the denial to commitment process that you went through to get where you are. Present the situation openly and allow a lot of time for questions and answers. 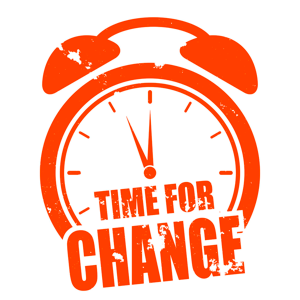 Have a training session on change management. Present a caring and understanding front. Though this may not be your normal attitude, during this process it will be invaluable. Be a broken record with memos, thank you emails, posters, or anything else that presents your platform in a positive light. It is at this stage that you may see the active signs of sabotage. They may be passive, as in “I’ll just do it my way anyway”, along with a lot of whining-crabbing about the new systems. Or they may manifest in physical methods of sabotage depending on the character of the person. Be aware that these are real threats to the success of any project. But for the most part, those who fall into this category will show a lack of interest and a lot of time spent on finding reasons it won’t work. Listen! And I mean listen. You can hear more in the tone and inflection of what is being said as well as the body language than you can imagine. Solicit Response. People love to know that they are being heard and even more that their suggestions are valid. Many of them are. These are the people who will make or break the installation, let them know they have input to the outcome. Acknowledge Feelings. Let them know you went through a similar process in getting where you are. Validate that they are not alone. People will begin to see some of the good that may occur in the situation, and will generally vacillate between thinking that it might be ok and that it is still a bad idea. But, the up side is that you are beginning to get them on your side and they will begin to make effort to get the changes in place. Facilitate. People are more open at this point. Take advantage of it. Be your own commercial! Challenge people to find a better way within the new system. It gets them thinking about the next round of change and off the current. Reward forward thinking with mounds of compliments. Praise the desired behaviour. Seek out new possibilities. Have brainstorming sessions. It does wonders for everyone’s moral. You’ve got buy-in and will see productivity through the changes. People can see the bigger picture and the opportunity that the change affords. When dealing with this from a management point of view, it is important to remember several things. These feelings are very real and they happen at different times for different areas of the organisation. Do not expect to spend several months agonising over the commitment to purchase expensive software only to turn around and expect everyone else to do a Tarzan swing from denial to commitment in a week. Remember the process you had to get through in order to accept the change. Others will require the same; allow the process to manifest itself in others. You can facilitate the process by understanding it and helping others to get through. Recognise and acknowledge those who get there. Give them more opportunity to improve the process and celebrate their victories. Inspire people to get others on board. Teach them about the process and how to recognise the people in various stages and how to move them along. CELEBRATE!!!!! Most important. When you have achieved goals, let everyone know and celebrate, celebrate, celebrate. When people know their efforts will be recognised and appreciated, you will have fewer problems in future change. Remember that we have a tremendous amount of information to process every day. There is more information in a single daily paper today than a person in the 15th century processed in a lifetime. Change takes form in one of three types; that which we cannot control, that which we can, and that which we can influence. Being positive and trying to move things from cannot control to can influence helps in the ability to manage the changes that occur. But, there will always be those things you cannot control and acceptance of that fact is the only road to remaining sane. Quality Management plans apply to project deliverables and project work processes. Quality control activities monitor and verify that project deliverables meet defined quality standards. Quality assurance activities monitor and verify that the processes used to manage and create the deliverables are followed and are effective. The purpose of developing a quality plan at the Stage 3 level is to elicit the customer’s expectations in terms of quality and prepare a proactive quality management plan to meet those expectations. The Quality Management Plan helps the project manager determine if deliverables are being produced to an acceptable quality level and if the project processes used to manage and create the deliverables are effective and properly applied. 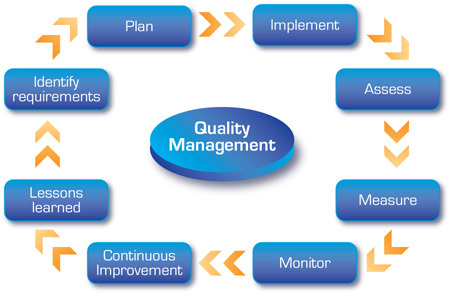 QMS standard may be a set of quality management tips that are adopted by thousands of organizations round the world. It provides processes and procedures to assist corporations improve the standard of the merchandise or service they supply. So as to attain ISO accreditation, businesses have to be compelled to demonstrate to meet variety of objectives for effective QMS implementation. Effective Quality Management System requires that the complete commitment and backing of senior management may be a very important component of achieving ISO accreditation. While not the complete support of the senior management team, the creation and implementation of quality management systems and processes can lack the impetus needed to form them winning. This will increase the chance that any enforced procedures will quickly fail, so compromising quality. ISO 9001 states that everyone comes should be planned completely and with quality as a priority in any respect stages within the life cycle of the merchandise, from style to manufacture to maintenance. Any changes or alterations within the style of the merchandise have to be compelled to be QMS 9001 documentation and recorded, and therefore the data of the amendment communicated to any or all relevant parties. It may be requirements of QMS 9001 that every one new supplier is completely vetted before any contracts are awarded. This is to determine the standard of service and products that the provider can give; similarly as guaranteeing that they need the resources necessary to satisfy your demand. This can lead to long and productive operating relationships with suppliers. All materials and product utilized in the creation and producing of an item should be completely inspected before use. This is often to confirm that they’re fit purpose, and every one testing records should be maintained and filed. Before a product is free to the general public, it should endure final testing and attain the sign-off of senior management. All businesses seeking QMS certification should do regular and thorough internal audits to check that the processes and procedures that are enforced among the corporate are operating and being well maintained. Any shortcomings, discrepancies or areas of improvement should be communicated to senior management and a point in time given for any issues to be corrected. Total Quality Management is a system of continuous improvement that involves all workers in a business from upper management to production line workers. The focus of the improvement program is to improve customer service and reduce waste in the business. Quality improvement teams use problem-solving techniques and analysis to identify and eliminate weaknesses in the company. Implementing a Total Quality Management system in a company requires extensive training of employees. The employee training includes instruction in problem solving techniques and the tools to evaluate a process and identify weaknesses such as statistical process control, Pareto diagrams and brainstorming techniques. During the initial training period, productivity can decline. Meetings for quality improvement teams also take workers away from their duties, which also reduce productivity. While the improvements do reduce lead time, eliminate waste and improve productivity, the beginning stages of implementing Total Quality Management in an organization can reduce worker output. A Total Quality Management program eliminates defects and waste, which reduces production costs in a business. As teams gather to identify and eliminate weaknesses in the business, the company continues to enjoy reduced costs and higher profit. Quality improvement teams can eliminate defects, reduce lead time and identify redundancies in the production process that can significantly add to the profit the company earns. Total Quality Management requires change in mindset, attitude and methods for performing their jobs. When management does not effectively communicate the team approach of Total Quality Management, workers may become fearful, which leads to employee resistance. When workers resist the program, it can lower employee morale and productivity for the business. Total Quality Management uses small incremental improvements to move the business forward. It can take years for a company to enjoy the benefits of the program. Once workers understand their participation and involvement in Total Quality Management is essential to its success, morale and productivity improve. Workers become empowered through participation on quality improvement teams. Businesses can improve morale further by recognizing improvement teams that make meaningful changes in the production process to reduce or eliminate waste. Internal Auditing – How Often ? Internal Auditing – How Often? Any organisation/business is required to conduct internal audits to maintain its ISO9001 standard. The audit involves testing out company processes and procedures to determine the standard at which they operate when compared to how they should work. Audits are designed to help employees but the mere mention of the word can see your staff sent into a panic, scrambling around to make everything look perfect. However, communicating yourself well to your staff on the benefit of the audits, and letting them know that this is not a finger pointing exercise, can serve well to make these audits more positive. Internal audits should be viewed in a positive light, a chance to take a step back and have your process reviewed by a fresh set of objective eyes. They are an ideal way to prepare for external assessment too. In some ways internal assessments can be more thorough as processes are examined more closely, more frequently and in greater detail than external auditors. ISO 9001 does not specify how often internal audits should be conducted. Instead, the requirements are that organisations audit based on how important a process is, the risks involved and whether there is an existing record of previous concerns. Consideration should also be given to quality objectives as these can dictate audit frequency. At the least, internal audits should be carried out annually. There are two ways around this – auditors may decide to review processes in one go, or they may portion off aspects and have a plan which details the schedule over a number of months. Complex processes may require more frequent assessment and this should be built into an internal audit plan. The audit plan removes the need for panic and helps eliminate an atmosphere of mistrust. It lets everyone know what will be happening and when, as well as allowing process owners time to complete any improvements that may be taking place. Although the audit plan is made general knowledge, the detail relating to timings should be confirmed with respective process owners as soon as is possible. The internal audit should not be seen as second string to an external audit and for that reason it needs to be as thorough as possible. Appointed auditors may benefit from some training and development to support them in getting the best out of the process. Auditors should apply a variety of methods to test the process including talking to employees, reviewing data and relevant documentation as well as and perhaps most importantly observing the process in practice. Part of being thorough is keeping accurate documentation that is a true reflection of the findings, for both management and future audits. The aim of the audit should not be to purely report non-conformance, but auditors should also use the opportunity to highlight areas of a process which may benefit from change. Therefore as important as the audit is the follow up. Follow ups are critical to ensuring that the audit cycle is closed off, and they are also a great motivating factor for further improvements.